A selection of positive reviews for Snow Queen from https://allthejuices.com/best-uk-eliquid/ where Snow Queen is rated as one of the top juices. “Saying that Snow Queen is a tobacco and menthol juice would probably be doing it an injustice. It is so much more than that. On the inhale is a round and balanced tobacco, light but with hints of dark leaves. There are also subtle hints of citrus. The menthol aspect is gentle and has hints of spearmint. Unlike a lot of menthol juices, the level of menthol in Snow Queen is perfectly balanced and is neither too strong so that it overpowers the other flavours, or too weak so that that it seems like an afterthought. All of the flavours are there to enjoy without any one component dominating. The whole experience is one of depth. The overall impression is of a perfectly balanced juice that is subtle and slightly sweet. There’s an excellent after taste that leaves a minty freshness with a pleasant tobacco note. Throat hit is excellent at the 24mg strength that I’m vaping and vapour production is also good from the 50/50 PG/VG mix. “This juice has been my alldayer since it was first launched. There are a lot of menthol juices around, and there are a lot of tobacco juices but no really outstanding menthol tobacco juices until Snow Queen, and believe me, I have tried them all. At first I didn’t know what to make of it, but after using it for a couple of days I was hooked, you have to give this juice a chance. The flavour is difficult to describe, it’s a complex tobacco flavour, without the toffee or caramel which makes the others sickly. The menthol is tuned just right as to not ruin the flavour but still give you that extra bit of a kick. The throat hit is what you would expect from a menthol, pretty much on par with a cigarette really, this all varies depending on your setup though. It’s 50/50 PG/VG (I think), vapour production will depend on your setup but if you like to blow clouds out of your mouth this juice will deliver, equally if you want to turn the airflow down and bit and enjoy the flavour without looking like a steam train it also lends itself to that. “I decided to try Snow Queen not quite knowing what to expect. I have never liked the menthol flavours but Snow Queen is an amazing blend and I love the juice. It is my ADV and despite trying numerous other juices I cannot find anything that even comes close to this or that I could consider using as an alternative ADV. 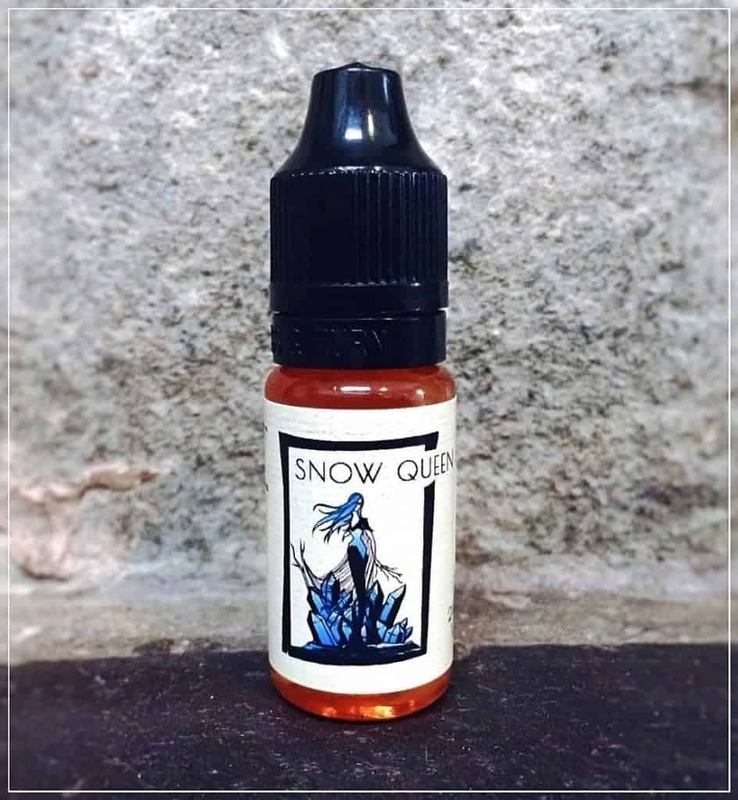 “For anyone wondering about this juice, thinking that they’ve tried menthol type juices before and didn’t like them, Snow Queen is definitely something a bit special. I’d say it’s less of a menthol tobacco, and more of a tobacco menthol, if that makes sense? The balance of flavours is just right. I was lucky enough to be chosen to beta test this juice. Some of the earlier tests were a bit too menthol-y for me, but now Paul has nailed the ratios down to a T.
I don’t get much similarity between this and BoH to be honest, other than the fact they’re both more complex than most juices. I find that just as BoH can taste different from day to day, so does Snow Queen. Just as BoH is, Snow Queen is easy on the coils too. After 15ml, my coil seems to be doing well.